Aged meat is purchased by the head and aged dry for 40 days in a special cellar. Our sanitary management is flawless. Our specialized 40-day aging process is to serve natural amino acids in a safe manner for your enjoyment. We pay special attention to the aging aroma and texture to be especially appetizing to many customers. For grilled steak, we offer both lean meat (rump, round tip, top round) and sirloin. 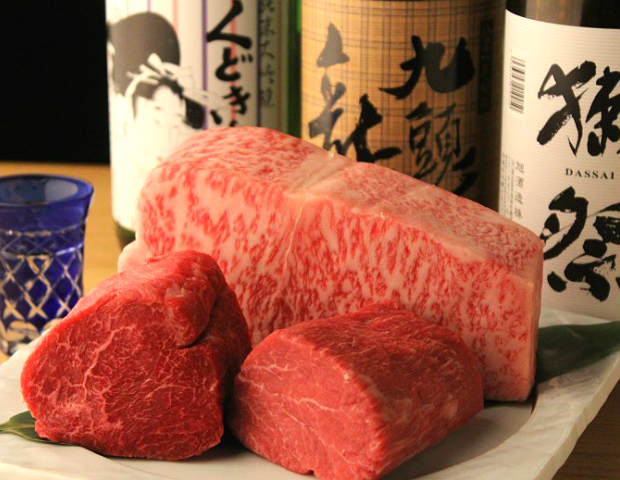 With our【Sukiyaki Hotpot】, you can enjoy rib roast among various other cuts. To serve only the tastiest portions of meat with our grilled steak, we exclude over 60% of the meat, offering you the remaining choicest 40%. Since this cut removes any unpleasannt tastes due to the sinew or fatty parts, it is named after a grade of Japanese sake as our "Pure Top Quality Cut." Served grilled, we offer sirloin, lean meat, and round meat with all excess sinew and stiffness completely removed (60%), serving only the soft portions. We apply this concept to all various cuts, from aged meat (lean meat, sirloin) to fresh meat (sirloin, fillet, chateaubriand). Especially so with our softest cut "chateaubriand," we routinely serve fillet with no more than approx. 800g available per cow. With food safety being our top priority, the texture of raw beef can be quite delicious, however, food sanitary concerns are essential. At MADOI, we are committed to serving impeccably safe food. Prepared with domestic rare-cooked beef, our yukhoe has flavour, consistency, and the finest rare meat texture. The moderate consistency of lean beef, cubed and flavored with soy sauce and wasabi. The rare texture delivers a taste that calls to mind "fresh tuna marinated in wasabi and soy sauce." 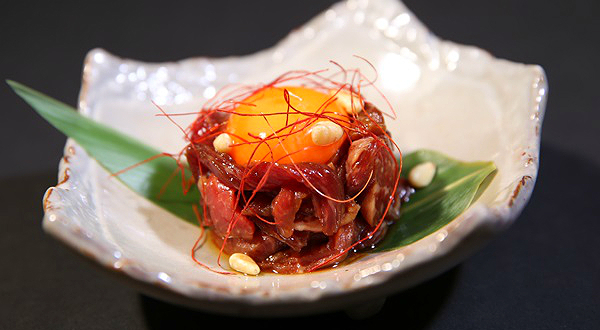 An extravagant dish possible only because the MADOI Group purchases whole beef by the head. 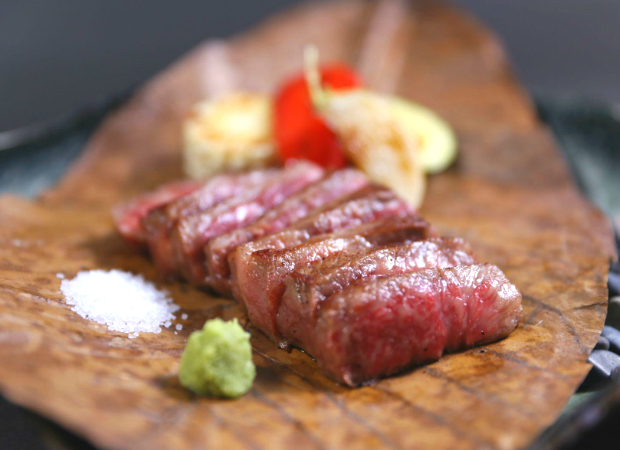 Using the ultimate grade of steak, A5 rank domestic Kuroge Wagyu cuts that are only slightly irregularly shaped are served as steaks with top quality flavor. The meat is lightly grilled on the outside with rare texture in the inside. One of MADOI's popular menu choices. We have also specialised in the finest quality of seafood selections, ranging from domestic spiny lobster, natural "red king crab," saltwater sea urchin, North Sea Japanese scallops, to snow crabs, etc. We serve a quality dish not be to be outdone by even the most high end traditional restaurants. This is a dish where even the lobser innards can be deliciously enjoyed. Our hot iron grill that is 3cm thick and over 200℃ extracts the maximum flavour from the spiny lobster. Generously bodied, richly flavoured giant red king crab is condensed with natural flavors. A simple pan-fried preparation yields the best flavors from the crab. Hokkaido's large Japanese scallops are presented together with saltwater sea urchin. Distinct from Alum sea urchin, enjoy saltwater sea urchin's flavours together with large Japanese scallops. Our interior dining space blends the comfort of "Japan" with the refinement of "the West" into "Japanese Modern." With its slightly subdued lighting, the relaxed space conveys both warmth and tranquility. We offer counter seats, table seats, and private rooms as well. Not limiting the main attraction to the counter seats is also a feature of MADOI's concept. Our top recommendation is the private rooms. We are accepting reservations for holidays, receptions, or other special meals, a restaurant that proudly suits any occasion.